For many, the sight of the sparkling and impressive shop window displays at Christmas time is part of what gives them a festive feeling. 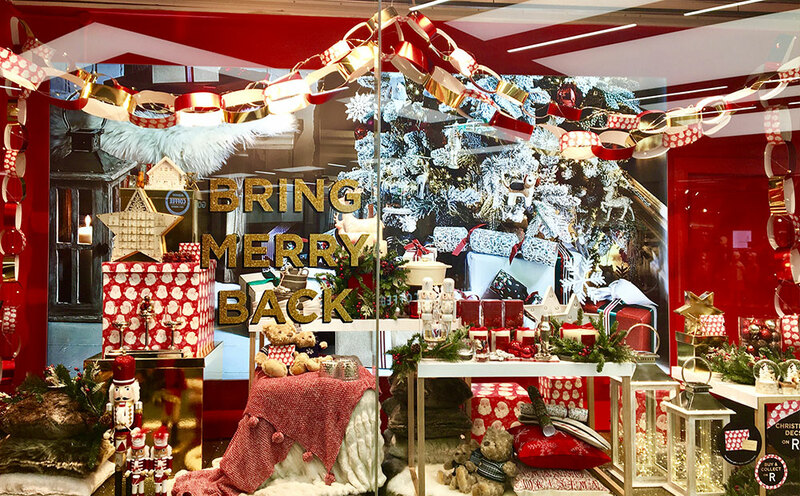 As the Christmas displays are swiftly switched to sale promotions, we look at how Mirri was used to create some Christmas magic for House of Fraser in their 2017 window campaigns. This year’s display showcased House of Fraser products, toys and decorations, used to create the look of a living room decked out for Christmas. 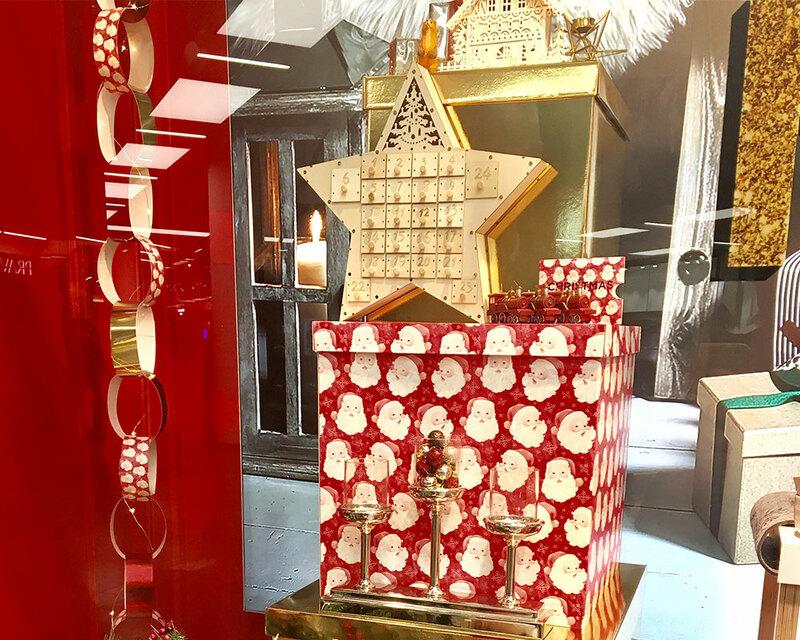 Alongside these, present boxes and decorations made from Mirri products were used to display items on and form one of the key features of the store window. Classic Christmas colours were selected from the Mirri range, including red and gold, which were mounted onto E flute to be used for the box construction. For the gold, Mirri Pak in Bright Gold was chosen, providing a shiny, reflective finish. This contrasted with the Mirri Silk Red, which was created using an anti-scuff laminate, providing a silky texture with a matt appearance, with added protection against scuffs and marks. The same two products were also used to create a classic decoration – the paper chain. Pieces of Mirri were cut and stuck together to produce paper chains that hung prominently at the front and all around the display. Mirri also supplied materials for some of House of Fraser’s instore concessions, including Clarins, where we provided 490 micron Mirri Pak Bright Gold for the FSDU used to promote their Detox Booster product. We also supplied 490 micron Mirri Pak Bright Silver for the POS signage for the gift section of the store. For more information on how Mirri can be used for POS, please contact Mark Askham, Mirri’s Business Development Manager, on: mark.askham@celloglas.co.ukor 0118 930 3656 for the Mirri department.